Don’t forget to do good things for others and to share what you have with them. These are the kinds of sacrifices that please God. Quite unexpectedly, I was given a gift as an expression of love. The gift was selfless and caring, and I knew that it took many, many hours of work to earn its purchase. So, what did I do when I received it? The passage above from the book of Hebrews tells us to do good things for others and to share what we have with them. It also states that these are the kinds of sacrifices that please God. God Himself continues to do good things for us every day. He shares all of His creation with us. He gives us unconditional love and offers us forgiveness. He sent His Son, Jesus, to die as a sacrifice for our sins, so that all who believe could spend eternity with Him. Since God has done so much for me, I want to please Him and show my gratefulness and gratitude. I was shown love tonight. I think God was pleased with that act of love. God wants me to show love to others. This is just one way that I can please Him. 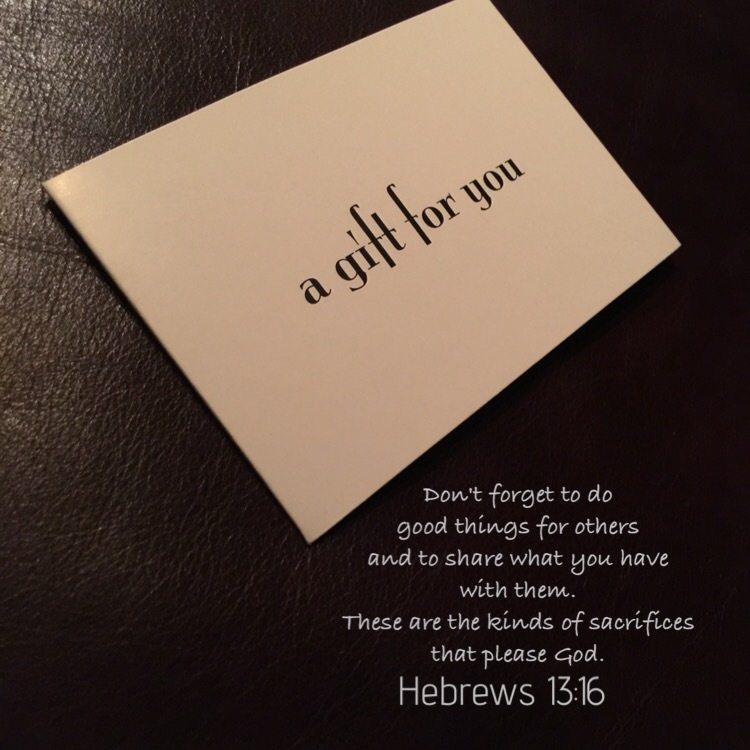 This entry was posted in Bible verses on photos, Inspirational photography, love and tagged gifts, giving, love, sacrifice.